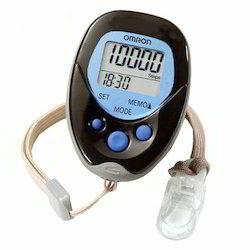 Providing you the best range of pedometer, omron hj109 pedometer and omron hj 113 pedometer with effective & timely delivery. 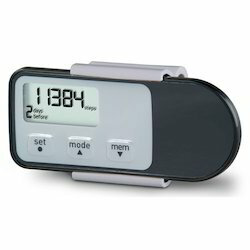 This classy Step Counter is designed for more demanding use. It will suit perfectly the needs of those who are dieting and improving their physical condition. 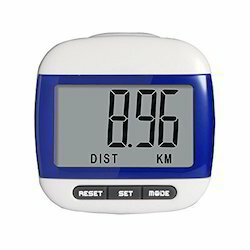 It will track your total amount of steps, total distance and the calories you burned during walking. After 10 minutes of walking at a consistent pace the aerobic mode is activated.-This aerobic mode helps you in building your health. 24 hour clock.- Step sensitivity can be adjusted.- Strong belt clip. In cumulative measurement, this Hold Memory function is effectively used. If an error occurs in measuring, press C/AC key. Then last measured value is appeared by pulse count. Since previous measured values before error are stored, there is no need to another measurements from the beginning. Automatic shifting of unit to upper unit:When the measured area value overtlows the displayed figures of 8 digits, the measured area value is calculated and displayed by an upper unit. When the overflows is occurred in the uppermost unit, km2, acre, the measurement can be continued by pulse count display.Average value measurement: In order to get better result of measurement, Mean value measurement is recommended. This measurement can be easily done on this N-Series.Measurement of an area with different lateral and longitudinal Scale. Counts Steps & Aerobic Steps. Counts amount of calories and body fat burnt. c$ eh in building your health. Your daily totals are stored in the 7-day memory. Step sensitivity can be adjusted. Erie  hr eed of these troublesome procedures. In cumulative measurement, this Hold Memory function is effectively used. If an error occurs in measuring, press C/AC key. Then last measured value is appeared by pulse count. Since previous measured values before error are stored, there is no need to another measurements from the beginning. Automatic shifting of unit to upper unit:When the measured area value overtlows the displayed figures of 8 digits, the measured area value is calculated and displayed by an upper unit. When the overflows is occurred in the uppermost unit, km2, acre, the measurement can be continued by pulse count display. Average value measurement: In order to get better result of measurement, Mean value measurement is recommended. This measurement can be easily done on this N-Series.Measurement of an area with different lateral and longitudinal Scale.